That’s how we became California’s leading independently owned rehabilitation services provider. In the seventies, San Diego therapy service providers didn’t offer much in the way of support services for their business partners. Occupational therapist Susan Harris saw what was missing, and revolutionized the therapy services industry in San Diego and, ultimately, California. 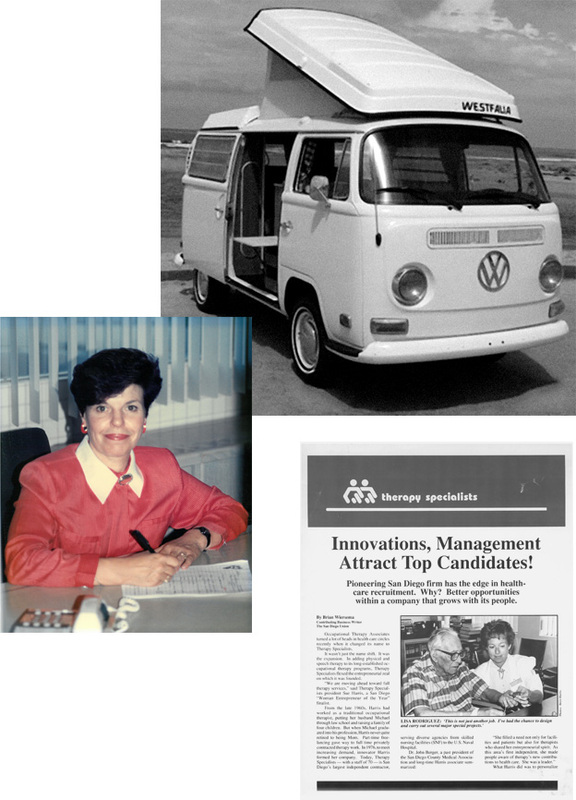 Harris outfitted her Volkswagen van with therapeutic supplies, documents, and resources for billing, and hit the road. With her mobile office, she delivered comprehensive therapy services directly to patients wherever they lived—in a hospital, at a senior care facility or in their own homes. In addition to providing great care, she also provided turnkey solutions and administrative support for her business partners. Susan was also instrumental in launching occupational therapy services at local hospitals for patients recovering from injury or illness. This kind of care was critical to the many service men and women returning from the Vietnam War requiring therapy to help with activities of daily living. Serving the long-unmet needs of patients, families, physicians, administrators, and associates, Susan found that her business quickly outgrew her van. Today, Therapy Specialists is one of the largest therapist-owned and -operated rehabilitation company in California. Best of all, the company never lost sight of the same commitment Susan embraced in 1976: to improve and enhance the quality of life of Therapy Specialists’ patients, business partners, and associates. To make a positive contribution to the physical and psychological health of our patients and our customers in the healthcare community. We respect the dignity of each patient and his/her right to the highest quality of life. We recognize every customer, and our mutual investment in achieving successful outcomes. We encourage our associates’ personal growth, and facilitate professional development opportunities.